Engagement is a fun time in a couples life. They look forward to their new life with anticipation and excitement while preparing for their special wedding day. This is meant to be a day that everyone can enjoy with minimal stress, and this can be easily accomplished with a few practical wedding planning ideas. Those who wish to pull everything together and be focused will need to be organized. To be able to accomplish this, you will need a few simple tool at hand. The most basic and necessary tool is the wedding organizer. This can simply be a three ring binder where you can store all of your information in one place. But it should also contain a calendar and some to do lists. Some prefer using a computer to store all of their information on wedding planning ideas. For those who are a little more tech savvy and like to carry their computer around with them, this is a good alternative. 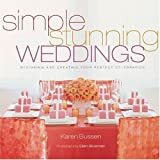 However, for someone who does not wish to carry a PC or deal with computer programs, a pen and pad in a wedding planner is much more simple. A wedding involves so many different venues and so much information that is impossible to keep track of without a method of organization. Things such as contact information, receipts, pictures, brochures, music sheets, appointment lists, guest lists, contracts, and deadlines will all need to be properly organized. If they are not, you will find yourself frustrated, overwhelmed, and stressed. Keep your to do list up to date and write down all your wedding planning ideas in the appropriate section of the wedding organizer. Details are everything, and it is always much better to have too much information rather than too little. You may find that you need to clean and reorganize this binder from time to time to keep the information relevant and easy to access. This will become a valuable resource and a keepsake for a later time. The day of your wedding can be a long drawn out day for everyone involved, especially the immediate families. There’s a lot going on during the day, and many people are just waiting for the reception to begin, especially the happy couple. As you probably already know, a wedding is the single most important and exciting event for a new bride. As the bride and groom both prepare to enter their new lives together, the entire family is usually very much involved as well. A wedding is an exciting time for family life as well. When a member of a large family gets married, the celebrations can be many. Family gatherings, bridal showers and wedding halls all cost money. One caveat that many people forget is that major costs can come from the smallest of items and these small items add up fast.